Two University of Wyoming researchers led a voyage to the bottom of the Pacific Ocean and discovered five previously unknown active hydrothermal vents and a completely new vent site. Crabs, shrimp, snails, Pompeii worms, small fish and bacteria flourish in an environment where sea water, as hot as 370 degrees Centigrade, flows upward through vent chimneys up to 22 meters tall. Barbara John and her husband, Michael Cheadle, both UW professors of geology and geophysics, recently co-led a research expedition aboard the U.S. Research Vessel Atlantis. With the aid of two small submarines tasked with exploring and sampling the sea floor, the group located the new hydrothermal vents, as well as two others that were last seen 23 years ago, at Pito Seamount in the Pacific Ocean. The two, along with Professor Jeff Gee from Scripps Institute of Oceanography at the University of California-San Diego, were the chief scientists for the 15-person research team from the U.S. and Canada. The team included four UW students. The expedition was funded by the National Science Foundation. Until 1977, no one had discovered an undersea hydrothermal vent, Cheadle says. Since then, about 300 such vents have been found on mid-ocean ridges around the world. The new vents were found at the summit of the 1-kilometer-high Pito Seamount on the East Pacific Rise. These vents form above fissures in the Earth’s crust -- roughly 2.3 kilometers or 7,500 feet below the sea surface -- and emit hot water from hollow chimneys that provide homes for a thriving community of unique creatures. One of the reasons these vents are important is that, if people want to understand how life evolved, the vents and their biological communities are analogous for how life started, Cheadle says. “Since they (vents) were first discovered in 1977, over 750 new species of animals have been recognized,” he says. John says it would be interesting to examine the cross-over between the biological communities in the hydrothermal vents in the Pacific with those in the Atlantic Ocean. The vents discovered are referred to as “black smokers” because they emit what looks like black smoke. The vents are essentially pumping out clouds of fine particles of sulfur-bearing minerals, which contain iron, copper, zinc and, to a lesser extent, gold. The vents ranged in height from 70 feet high to small “chimlets” that were only 1 meter tall, John says. To add a little fun to the discovery, the researchers bestowed names -- such as “Jason” and “Medea” – on the vents. The names were in honor of the submersible vehicles used during the expedition. In one case, a vent was named “Scotty’s Castle,” after one of the crew members. In another, a vent was named “The Sniper” because the crust formation resembled a head and a hand holding a rifle. In addition to discovering, imaging and measuring temperatures from the seven hydrothermal vents, the very successful expedition also saw the science team collect important rock samples from the ocean floor (6 kilometers deep below the ocean’s surface) and conduct the first detailed geologic mapping of the gabbroic crust. Sixty percent of the Earth’s surface is the sea floor. “We did the most detailed mapping of the lower oceanic crust ever done,” Cheadle says. “And accomplished all of our project goals, as well as discover the vents,” John adds. The goals included a number of educational outreach opportunities -- 34 live ship-to-shore broadcasts that reached more than 1,000 people, ranging from kindergarten children to 80-year-olds. Audiences included the UW Lab School; the Geologists of Jackson Hole Society at the Teton County Library in Jackson; the Mineral and Gem Society in Cheyenne; the Wyoming Geological Association in Casper; and the Birch Aquarium in San Diego, Calif. Other outreach locations included Cambridge University, colleges in California, and middle and high school students in Massachusetts, Minnesota and Wisconsin. The Atlantis left from Easter Island Jan. 13 to work at Pito Deep before returning to Arica in Chile Feb. 24. But, before leaving the research site, the team had one last mission. 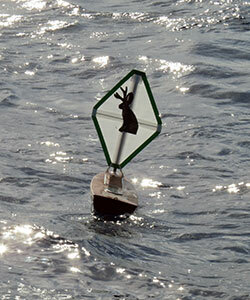 The Jackalope, a small sailboat built by middle school students in Theresa Williams’ UW Lab School class, was launched on the day the Atlantis began its trip home. The small craft, outfitted with a GPS and tracked by the National Oceanographic Atmospheric Administration, is making its way around the southeastern Pacific, currently sailing between the Pitcairn and Easter islands. Its movements can be tracked at http://educationalpassages.com/boats/00-172231121/. The boat includes instructions in nearly 20 languages chosen as read/spoken around the Pacific. These include Cantonese, Chinese, English, French, Mandarin, Papa New Guinea, Portuguese and Spanish, so that anyone who finds it can correspond with the UW Lab School students. Additionally, it contains a waterproof time capsule hosting information and pictures of UW and Laramie. “It covered 120 kilometers in one 24-hour period,” John says of the 5-foot-long boat. “Nobody has ever launched one of these in the Pacific,” Cheadle adds, pointing to a map on his laptop that showed the current location of the Jackalope, as well as other similar tiny vessels in the Atlantic. Neither was sure where the tiny vessel will eventually end up. Cheadle expects it may get caught in the westerlies of the “Roaring Forties” (strong west-to-east air currents), and eventually reverse direction to head back toward South America. For more information and videos about the expedition, go to www.pitodeep.org/.